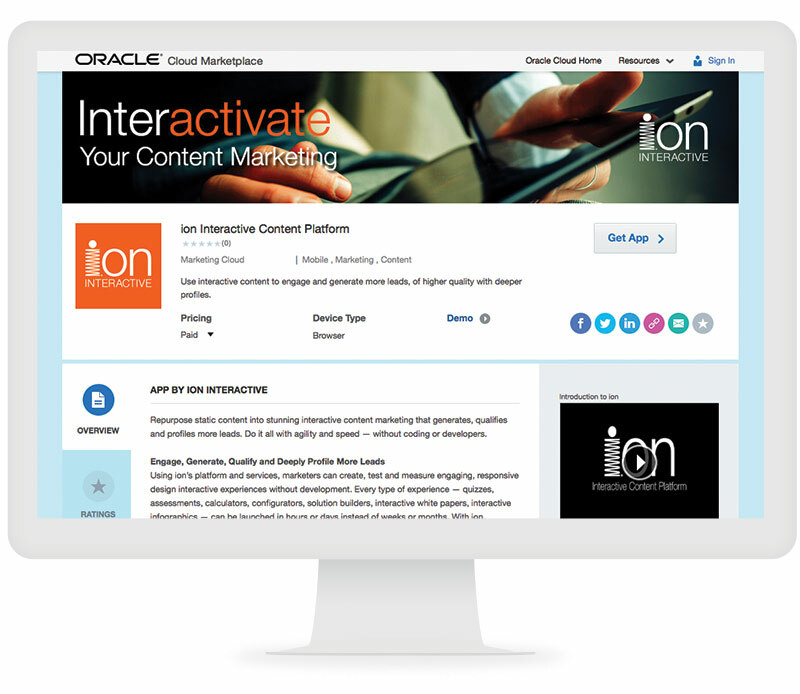 ion interactive today announced its interactive content marketing platform’s availability on the Oracle Marketing AppCloud. This latest version of ion’s SaaS platform helps marketers use the interactive dialogue to qualify leads and personalize their journey with Oracle Marketing Cloud. The Oracle Marketing AppCloud is one of the industry’s most comprehensive marketing technology ecosystems, offering Oracle customers a broad set of marketing apps and data services to extend and optimize their technology investments. ion’s interactive content marketing platform engages buyers in a digital dialogue, revealing valuable lead characteristics. ion bi-directionally exchanges this rich data with Oracle Marketing Cloud, enabling Oracle Marketing Cloud customers to accelerate lead-to-revenue velocity. The digital dialogue reveals a buyer’s needs and impediments, enhancing a marketer’s ability to rapidly and accurately target, segment and qualify. And, with ion interactive’s Sell-Side capability, the sales team gains complete and instant visibility into this revealing buyer’s journey. “ion is thrilled to participate in an online community as vibrant and modern as Oracle Marketing Cloud. Our shared customers now have the ability leverage data from the interactive buyer’s journey across their Oracle Marketing Cloud ecosystem. It truly is a match made in heaven,” said Justin Talerico, ion interactive’s CEO. Oracle Marketing Cloud customers can visit ion interactive in the Oracle Cloud Marketplace to install the application and begin implementing ion in Oracle Marketing Cloud. ion interactive empowers modern marketers to rapidly produce engaging, interactive content that stands out while generating more leads, of higher quality and richer prospect profiles. Produce stunning content marketing experiences across your social marketing, email marketing and advertising campaigns using our scalable, agile interactive content platform. Powerfully creative, gorgeous and highly interactive experiences can be produced, tested and measured without development. ion’s assessments, quizzes, lookbooks, ebooks, interactive white papers, calculators and more are used to differentiate brands, increase engagement, boost revenue, improve conversions and enable sales. ion Interactive Content Platform - Oracle CloudRepurpose static content into stunning interactive content marketing that generates, qualifies and profiles more leads. Do it all with agility and speed — without coding or developers.